Unlike the Brush Tool, the Pencil Tool's edges are aliased. The term aliased refers to the edges of an object being "jagged," in contrast to an anti-aliased object, in which the edges are "smooth." 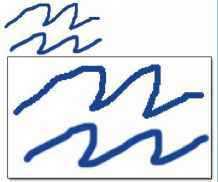 In the two examples shown here, the top shape in each example was created using the Pencil Tool, while the bottom shape was created using the Brush Tool. Notice the difference in the "jaggedness" of the edges of these curves. We'll look more closely at anti-aliasing when we discuss the Text Tool. The Paint Bucket Tool (C) fills a selection with a flat color. To use the Paint Bucket Tool, click once in the area that you wish to fill. If the chosen area is not within a selection, the Paint Bucket Tool will fill all similarly-colored pixels within the vicinity of the clicked area. The Gradient Tool (C) fills a selection with a blend of two or more colors, known as a gradient. You can easily create your own gradient, or use any of the preset gradients available in Photoshop. The Gradient Tool is not available in ImageReady. I find that I use the first two gradients—the foreground-to-background gradient, and the foreground-to-transparent gradient—most often. The former will blend your foreground color into your background color, while the latter will blend your foreground color into a transparent background, giving it a "fading out" effect. The Text Tool (7), true to its name, creates text layers. This one's easy to use—just select the Text Tool, click on the canvas, and start typing! You can also click and drag to create a rectangular text area that will force text to wrap within its boundaries. You can change the font size, color, and other text properties using the options bar along the top of the window. When the Text Tool is active, you can move the cursor outside of the text area. The cursor will change from the "text insert" cursor to the "move" cursor, and you'll be able to move the text layer around. It's worth noting that when the Text Tool is active, you can't use keyboard shortcuts to access other tools. This may seem like an obvious thing to point out now, but it won't always be so apparent—especially when your text mysteriously starts spurting strange characters because you've been trying to use the shortcut keys! You can create shapes simply by clicking and dragging Photoshop's Rectangle, Rounded Rectangle, Ellipse, Polygon, Line, and Custom Shape tools (U).